I write a kid activities blog and yet I have never made slime. How can that be? I don’t have any good excuse except that neither of my kids have a great appreciation for sensory play. My oldest son flat out refuses to touch anything slimy, gooey or sticky, and his brother is very hesitant. 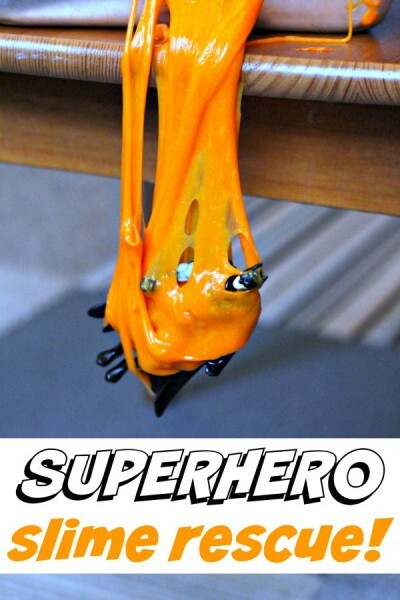 … which is why I decided for once and for all it was time to whip up a batch of slime. When it comes to slime, there is no better place to look than Asia Citro’s new book, 150+ Screen-Free Activities for Kids: The Very Best and Easiest Playtime Activities from FunAtHomeWithKids.com! Anyway, on to the slime! 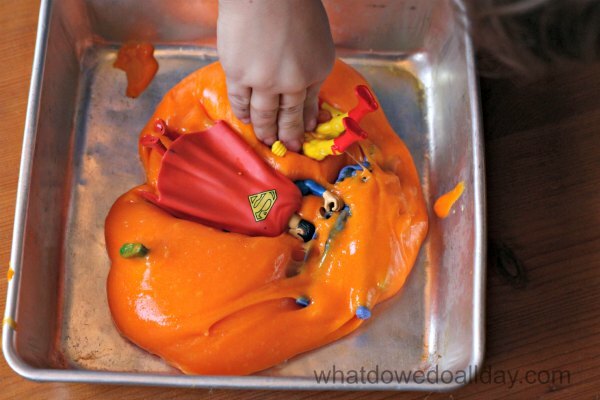 Anyway… while I was stirring up this gloopy, orange-y, slimey goodness I was worried that my kids would reject it. They love bubbles, and making big giant messes, but it has taken effort to get hands messy with things like shaving cream. Then it occurred to me there was one way I could guarantee my 5 year old would take a risk. I would hide his superhero action figures in it! On the walk home from school, I peaked his interest by telling him that his superheroes were at home, trapped in an orange blob. “They need rescuing!” I declared. Needless to say, he had nooooo idea what I was talking about. 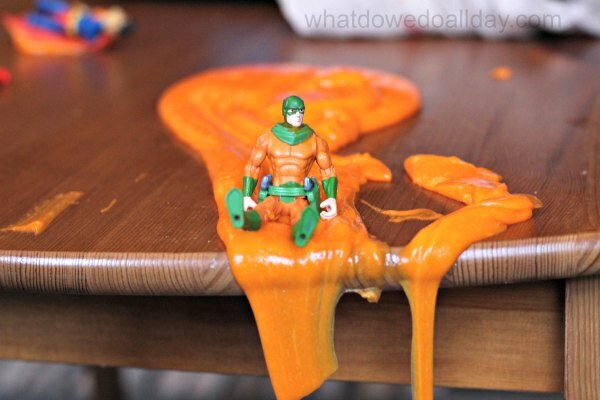 At first, he didn’t want to get his hands in the slime (and his brother did decide to sit this activity out, darn it.) but I started playing with him and he gingerly tried it out. As you can see from all the photos, he got quite into it. 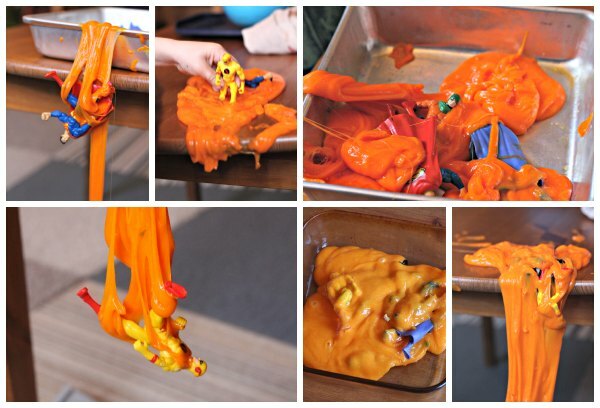 Doesn’t it make you want to whip up a batch of slime for the first (or 100th) time? If you are looking for some unique and fun ideas (not all of them are messy!) to tempt your kids away from screens, I highly recommend 150+ Screen-Free Activities for Kids: The Very Best and Easiest Playtime Activities from FunAtHomeWithKids.com! The book is available worldwide! Think: gift idea! What fun, my son would love this!! Oh my goodness, I forgot about Ghostbusters! Yes, that would be a fun connection.